If we are being completely honest, when we first did the site survey for this job, we were not sure we were even going to be able to pull this one off. We measured (and measured some more), and weighed out every option and possibility we could think of. Thank goodness for our expert team of guys, who I’m starting to believe can make anything happen, and we came up with a plan! This chic and elegant wedding was the perfect way to kick off our spring wedding season. We set up two different structure tents, one on stage risers to make sure the tent was level where it needed to be, and made it the perfect venue for the bride at her childhood home. With a welcome tent, and two structure tents, it gave plenty of seating for over 700 people. 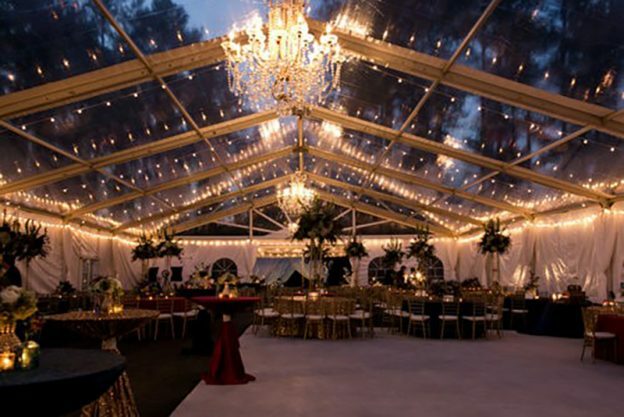 Our clear top tent with pearl lighting and chandeliers set a romantic glow through the tent. When the sun goes down, the lights in the clear top are just magical! You can see for yourself that this wedding turned out to be absolutely beautiful and ended up being the perfect night for the bride and groom! This entry was posted in Weddings and tagged event planning, event tents, georgia, south carolina, weddings on July 25, 2017 by admin.